We know that your invitations needs to look elegant and of the finest quality. That is why we only offer our wood invitations on premium card stock. 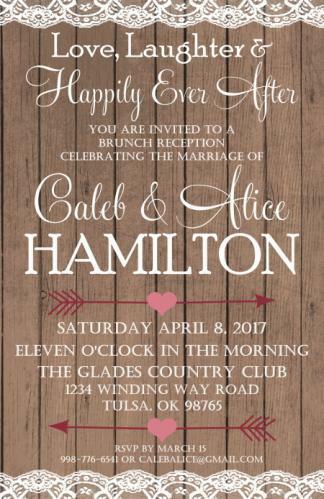 The text on the image shown is just example, we will quickly work with you (whether for a wedding, shower or other celebration) to professionally lay out your text to create a custom, one-of-a-kind invitations. Want to change the colors of the invitations? It would be our pleasure to accommodate you! Your wood invitations order is professionally printed on premium matte or glossy paper. Perfect as Rustic Wood Baby Shower Invitations too!